A flexible bit of kit and essential if you already use IK Multimedia's apps. Easy to use. Fairly rugged. Extra inputs. Might not stand up to touring. The only problem with playing guitar on your mobile device is that there are too many wires. So when IK Multimedia decided to make a foot pedal controller for its Mac and iOS products, it made the right choice by dispensing with cables altogether in favour of Bluetooth. 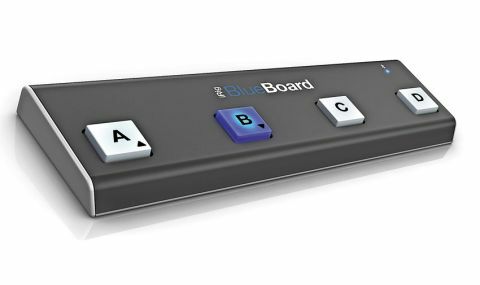 "The BlueBoard converts the control signals to MIDI, allowing you to pair the device to AmpliTube, or other Core MIDI software." The iRig BlueBoard is a rugged and well-built, albeit plastic, pedal board that features four backlit rubber buttons. Powered by four AAA batteries, the BlueBoard also features two extra MIDI inputs to connect expression pedals. Complete with its own app, the BlueBoard converts the control signals to MIDI, allowing you to pair the device to AmpliTube, or other Core MIDI software. The BlueBoard feels like it can take a knock or two despite the plastic chassis. The unit itself is quite solid and features rubber feet to prevent it moving about on most surfaces. Having gone from the use of the traditional latching button on the iRig Stomp, the blue backlit rubber buttons feel a bit too lightweight under foot. However, the board itself is a good size and the buttons are a good width apart, so the burliest size 13 shouldn't be hitting two buttons at the same time. Programming presets to the board's four buttons is easy, you can either go for a simple on-off approach with the effects pedals, or have whole amp, mic and effects set-ups with each preset. The BlueBoard will seamlessly integrate itself with most apps from IK Multimedia, the most obvious being AmpliTube. The unit will also lend its preset hopping skills to SampleTank, VocaLive and iGrand Piano to name but a few.